What Happens at Tara Hall? It begins with someone noticing something is wrong, and making a call… a friend, teacher, doctor, neighbor or family member, anyone. Tara Hall takes each boy just as he is a-child with a unique history and individual needs. 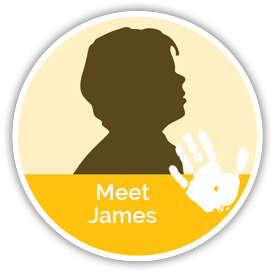 We teach him to replace bad habits with good and help him make good decisions. Tara Hall gets to know each family and meets them where they are as well, with the intent to work with them and help them help their child moving forward. Tara Hall is first and foremost a safe place you can trust. Established in 1969, more than 600 boys have passed through its doors. The unique structure, time-tested approach and on-campus school set Tara Hall apart from other group homes. With each passing year, the future for so many young people grows dim as they struggle to develop in an uncaring and even dangerous environment. Today, issues faced by children are more complex and more difficult to navigate than ever and the list of options grows shorter. 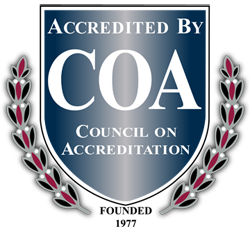 The Council on Accreditation is “an international, independent, nonprofit, human service accrediting organization.” The standards they set are high. This certification came through hard work, commitment to these standards and the community, and a daily effort to make an impact through performance on every level. ABOUT US - Established. Respected. Unique. Not a statistic or a product of unsafe, unsupportive circumstances beyond his control. HE LEFT a strong leader, respected by his peers. HE LEFT caught up to grade level and with the skills to continue excelling in his education. HE ARRIVED neglected with no sense of belonging. Are You Ready to Help Us Help a Boy? 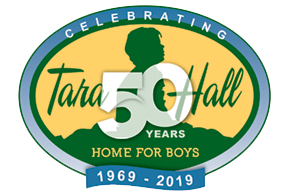 Choosing to support Tara Hall, a shining star committed to changing the vision of young men, means your time and money will be well spent—impacting the children, the community and the state of South Carolina in larger ways than you could imagine. With your help through Tara Hall, the future is bright! Tara Hall is celebrating 50 years and Paddle Fest is on the way. Sign up here for updates on all of the exciting things planned for this year.